Ethan Frome is structured as a story within a story: an unnamed narrator becomes intrigued by Ethan Frome, a man he first hears about while spending the winter in the town of Starkfield, Massachusetts. This structure works really well, I think, because from the very beginning readers are made to share the narrator’s curiosity. Frome strikes our narrator as a broken man; as a man who once had dreams and ambitious which for some unknown reason were curtailed, reducing him to a shadow of his former self. It’s only when, due to a severe snowstorm, Frome offers him shelter for the night at his farm that the narrator gets to the truth behind his sorrow. And the truth is a tragic story that took place twenty years earlier; a story of forbidden love, three smothered lives, and desperate unhappiness. My reading of Ethan Frome was influenced by a conversation I had with Michelle: she recommended that I read it shortly after The Awakening, as she felt that both books dealt with many of the same themes. I agree – there are some obvious differences, but at their core both are novellas about people trapped by circumstances that lead them to desperate actions. The main difference is of course the fact that in The Awakening gender is very much in the foreground: the fact that Edna Pontellier is a woman is a direct cause of her entrapment. Ethan Frome is a man, so his problems are not exactly the same as Edna’s, but I thought that they were caused by the very same social structure: a structure in which divorce was unthinkable; in which for a married woman to support herself was unimaginable; in which whatever mistakes you made would define the course of the rest of your life. It’s a harsh and merciless social world, and Ethan Frome, Zeena and Mattie are extreme examples of what could happen to people who were ensnared by conventions. And more than just to conventions, they fall victims to their own best feelings, to kindness and to love. There’s no denying that Ethan Frome is a miserable and desperate book, and its desperation is all the more real because you can truly feel the characters’ lack of choices, their helplessness and their vulnerability. There was absolutely no way out for any of them. The social norms that limit them are aggravated by poverty and illness, leading them to an absolutely hopeless situation. But despite all its bleakness, I found this a beautiful book. The descriptions of the harsh winter, Wharton’s gentle irony, the dialogue, the few hopeful moments when happiness seems possible, and even the very misery of the situation the characters are in all contribute to make this a powerful and unforgettable story. I think I’m no longer afraid of Ms Wharton. The Age of Innocence next? I love Edith Wharton and yes, you should really go for 'The Age of Innocence' next. Believe me, you won't regret it. Given, the social premises of AoI are completely different, but I've already read the novel twice and the second time round, I loved it even more than the first. And I really like your comparison of 'Ethan Frome' with 'The Awakening'. I've never thought about comparing those two, but you've got a point. I've never actually read any Wharton but you've convinced me that I must try. I remember seeing the film of this a while back (my fellow countryman Liam Neeson was the lead). Sounds like a good introduction to this writer - I like bleak novels! I read Ethan Frome I think a few years ago and I remember it left me impressed. I have read the Age of Innocence, but I was only 16 and I have a feeling that I need to retry it sometime as I think I will like it better. I am also intimidated by Edith Wharton's work, I'm always afraid I will not "get it" when I read it, so I rarely start. I am into the bleak novel style. I t is reminding me a little of the bleakness I have found in Wuthering Heights. I really haven't encountered Wharton's work before, but I really like the sound of this one. I have long heard of this book, but I've been afraid it might be beyond me. After your review, I don't think so. I don't mind bleak...sometimes there is so much beauty in bleak with the right author. Desperate and miserable have alays steered me away from this book. It's so sad the damage that social conventions can do! I will have to check out this book, as I loved her other book 'The house of mirth'. I also plan to read some of her short stories. Great review! Ethan Frome is one of my all time favorites & your review makes me want to reread it. Love it! My older sister had to read this in high school and she moaned and groaned about it so much, that I've avoided it ever since. I think I need to explore it. It took awhile for this book to grow on me. Immediately after I finished it, I thought it was a horribly depressing and hopeless read, and I didn't like it very much. After a bit of thought, I began to see what a wonderfully complex and beautiful story it was, and I was really able to appreciate the predicament that the characters were in. I ended up considering this a favorite. Great review, Nymeth. I am so glad you loved the book. Just because it was bleak doesn't mean it wasn't moving and wonderful! I'm afraid that I read The House of Mirth in my pre-blogging days, and I had such a hard time connecting with it. I personally didn't gel very well with Wharton's style, and so I've steered clear of her works ever since. I've heard many people say that this novel is her most challenging/demanding, so I'm glad to hear you had such success with it. I think that if you enjoyed this one, then you'll probably enjoy anything else Wharton wrote! Awesome review (and thanks for the link love to my review :)). 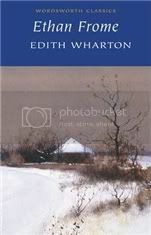 I love Wharton and Ethan Frome is probably my favorite of her books (so far). Like you, I found it beautiful despite the bleakness. I really should re-read The Awakening some day - I read it in college and have mostly forgotten it. Your review today reminded me that there are some classics I should read again! This is one of the stories that stayed with me for years. Actually just the ending and the shock that came with it, plus the image of the broken plate which I always relate to uh, a wife's intuition. Funny how, in defying conventions, in making that one fateful decision the three end up like that. Tsk tsk tsk. Well back then and still up to now society's expectations shape people's decisions, one way or another. Maybe they would've fared better in our world. Or not. Haha. Lovely post. I loved the writing in Ethan Frome too. I wasn't a fan of Age of Innocence but liked House of Mirth and Custom of the Country. Summer is also good. It's her "Ethan Frome in summer." I've been meaning to give Edith Wharton a go for some time. I read The Touchstone, a novella of hers, a few years ago and loved it. I want to find one that I have not seen a movie version of. Ethan Frome fits the bill. I didn't enjoy this book, probably because I was forced to read it in 11th grade. I was reading it against my will, and it didn't resonate with me at all. Sadly, many wonderful books and authors are spoiled when well-meaning teachers force them on readers at the wrong time in their lives. :-) I have since enjoyed The Age of Innocence. Maybe I'll try Ethan Frome again and pair it with The Awakening, as you mentioned. "But despite all its bleakness, I found this a beautiful book." Yes! I agree with you on every point in this review! I totally think you should read The Age of Innocence next! One of my top two favorite books ever. Although I'm now a little afraid you won't like it, I think you will. It's not the same as Ethan Frome, it's more of a society novel, but I loved it regardless. I was surprised to love Ethan Frome when I read it last year, but I really did. Perhaps even especially for its bleakness! It's interesting to hear it compared to The Awakening, which I haven't read yet. From what I know it certainly makes sense though. I'm sure you will like The Age of Innocence as well, but I think that like Trisha I probably prefer Ethan Frome. That's probably more because of the subject matter, though. They are quite different as far as that goes. This is the first I'm hearing of this book, which really surprises me. It sounds like such a powerful story, one that stays with you for a while. I also love that cover - the scenery is so peaceful! Obviously I need to go back and reread this one. I read it in high school and wasn't very impressed. However, I read The Awakening in college and loved it! Of course, I blame part of that on the teachers. My prof in college was seriously awesome. My high school teacher? Not so much. Of course, I have always been slightly afraid of Ms. Wharton! I've only read one Wharton book, The Glimpses of the Moon, but would highly recommend it. Not as tragic as Ethan Fromme but also about people being trapped by their circumstances. I really want to read more by Wharton but I sort of feel like I'm saving up Age of Innocence after I've read a few of her other books. I haven't read this since high school, and, while I loved it then, I think I would get a new perspective reading as an adult. I personally would recommend House of Mirth next. The Age of Innocence is one of my top 5 books, too. You must read it! I enjoyed this one too. I'm not sure I've read about a man so entrapped by social constructions, I was intrigued. And Wharton's descriptions of the landscape were wonderful. I haven't read Age of Innocence but it does look like it will be good. I haven't read this, but I think I'm going to have to. Sounds intriguing. Ethan Frome is one of the few Wharton books I haven't read yet, though I own a copy. I like what you said that the mistakes you make would define the course of the rest of your life. A very astute and correct observation. The House of Mirth or Age of Innocence have similar themes though Mirth is a little harsher. The judgments some people had to live with! You can see some of it lingering in older generations. My friend's daughter got pregnant and the (will be) Grandma really believes she will be tainted for the rest of her life! Thankfully, belief systems like this seem to be diluting with time. Great review! I haven't read this for years. Definitely looks like I am in need of a re-read. I read this a hundred years ago. I remember that I felt only meh about Wharton. Perhaps now that I am well past high school :-) I might have a different reaction. Maybe next year. Reading The Hobbit and LOTR is enough rereading for one year. I haven't read anything by Edith Wharton but she is definitely an author I want to read something by. Don't know whether to start with this or Age of Innocence. Great review Nymeth, this sounds really good, yet very sad. I still havent read this author. Great review -- I'm so glad you liked it! It's such a bleak story, yet I find it really resonates with me. I've read several Whartons now and that's still my favorite, tied with House of Mirth. Age of Innocene is also good but I found it much slower. Even though many of her books deal with upper-crusty society people, some of the same themes exist -- being trapped in your circumstances, overwhelming social conventions, etc. I haven't read it yet, but her novella Summer is supposed to be sort of a companion to Ethan Frome -- she called it a "hot Ethan." That might be a good follow-up. And I always recommend her short stories. I first heard about this book on, from all things, The Simpsons when Lisa gets a first edition. I've been intrigued ever since but I haven't actually actively seeked it out. Ah, The Simpsons - what will we do without it? Oh I adore this book! I was so surprised by it and never expected to fall in love with it the way I did. I honestly think that this is one of the most romantic books I have ever read. The love story between Ethan and Mattie blew me away. I just loved the bleakness of it all too. I have The Awakening to read too - must get round to that. Read this one in high school. I remember really enjoying it at the time, but now that I think of it, I don't remember much except for a sledding incident and something to do with the color red. Hmmm. Ah well, it's awesome you liked this book. I think a few of those things still do constrain people today, maybe not as much, but I think they factor in. I've never read Edith Wharton. But I've been curious for quite some time. Basically, I've been scared of trying out her books. I think some day I will take the big step! I recall reading this book in school and enjoying it. I think it is time I considered rereading some classics. The Age of Innocence is my favorite Wharton! But I've only read a few. I didn't love this as others seem to. IT seemed so simple to me. And I really didn't trust Ethan's story. I felt we weren't really seeing the true Zeena. But my book group laughed at that idea. Truly Zeena was a devil and no way around it. What do you think? What if Ethan wasn't telling the story? I just wonder if we got the truth of what happened. Melody: As do I :) It's a narrative technique I'm quite partial to. Susi: I promise I'll read The Age of Innocence before too long! lovelytreez: I actually didn't know there was a film! I seem to live under a rock :P This was my first Wharton and it was a big hit, so I'd definitely recommend it as an introduction. Sandy, I don't think it'll be beyond you at all! I was quite surprised by how accessible it was. Andreea: I'd love to read her ghost stories in particular! Perhaps this fall. Priscilla, thank you for the recommendation! I'll keep it in mind. Elisabeth: I'll probably return to it too in the future. I bet I'd pick up on a lot more at the beginning now that I know what happens. Kathy: It seems that many highschool students hate it - but I found it not only accessible, but very hard to put down! Zibilee: Yes, exactly! But sometimes it takes some thought for us to be able to appreciate that. Steph: I'm sorry to hear you didn't connect with her style, but I'm glad to be told I'll probably enjoy her others! Amy: Make sure you keep tissues at hand :P But yes, do try it. Trisha: They both seem love it or hate it kind of books. I wonder how I'll feel about it! C.B. James: Adding The Touchsotone to my list! I love that you aren't afraid of Wharton anymore. Meghan: I hope I will! The fact that you love it so much certainly encourages me. Emidy: I loved the descriptions of Winter in the book - they were harsh and kind of claustrophobic, but beautiful too. Heather: A good teacher can make a world of difference! Iliana: Thank you for the recommendation - I'll definitely keep The Glimpses of the Moon in mind! I love that title, btw. Danielle: Yes, the landscape descriptions were fantastic, and they fit the tone of the story so well. Jaimie: Even harsher? Now I'm slightly scared to read it :P And yes, those attitudes are still around, though to a lesser extent. Beth: Re-reading Tolkien is quite an undertaking, yes! Elise: Well, this one is shorter, so it'd be a quick way to find out whether you get along with her style. Naida: I think you'd really like this! Karen: A companion to Ethan Frome? I'm very curious now! By the sound of it, I think I'm going to like all of her stuff, pretty much. The Book Whisperer: I just felt so bad for them. For everyone really. And yes, do read The Awakening! April: The sledding scene is pretty difficult to forget! And yes, I completely agree. Diane: I think this one would be even more enjoyable on a re-read! Rebecca: I see what you mean, but I guess I just read Ethan's story differently. I did trust it, but I didn't read it as demonising Zeena at all. He didn't love her, so the way he portrayed her reflected that, but she was just as trapped as he was. And when he realised what would happen to her if he borrowed the money to run off, he acknowledged that, I think. I honestly felt as bad for Zeena as for Mattie and Ethan. Nymeth, I felt bad for Zeena too. I also thought she was trapped. But the others in my book club thought I was strange! They hated her and didn't think she deserved any sympathy. Well, I think *they're* strange ;) Seriously now, this is my first Wharton so of course I can't say much, but from what I know of her as an author I doubt she'd want to single out a character for judgement like that - especially someone in a position of such powerlessness. Of course, readers are still free to take away from the story what they will. But poor Zeena! I am so glad you are no longer afraid of Edith Wharton. She is such a fantastic author, and I think, very accessible, in a way that Henry James is not. Age of Innocence is very good and quite different in setting and subject than Ethan Frome. I see what you mean, Thomas. I found the James I've read so far worth the effort, but there was certainly some effort involved. But Ethan Frome really was incredibly accessible. I look forward to reading more of her work.